The weather cooperated. The early morning grey skies receded and the sun broke through over Bridge Square in a show of support for Bring Your Bike to Work Day. 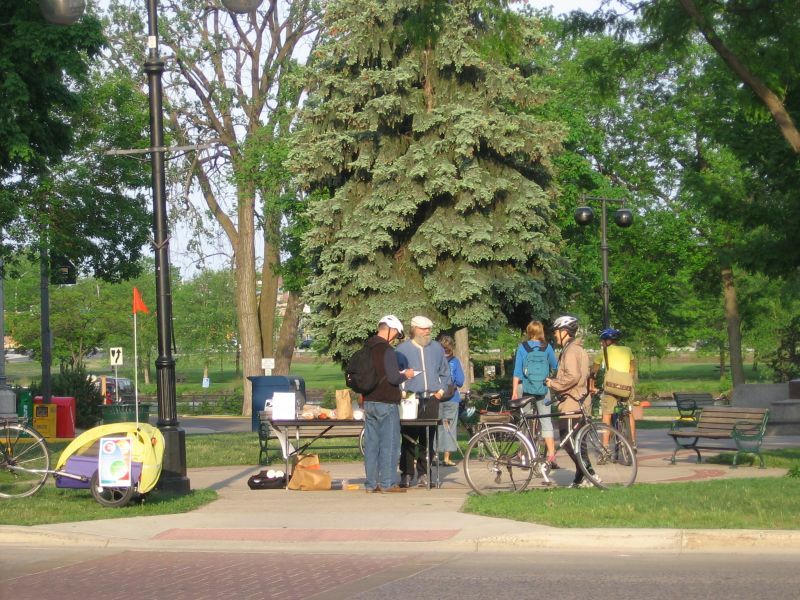 At about 7:30 this morning, the bicyclists were coming and going to and from a table offering literature and sustenance in the heart of our community. Staffed by volunteers from RENew Northfield, the hospitality station was a lively stop for downtown commuters. Although both the benefits and challenges of biking around Northfield are numerous and significant, the feeling of the impromptu gathering was celebratory. As Britney and Paris would no doubt tell us, it’s all about the camraderie.